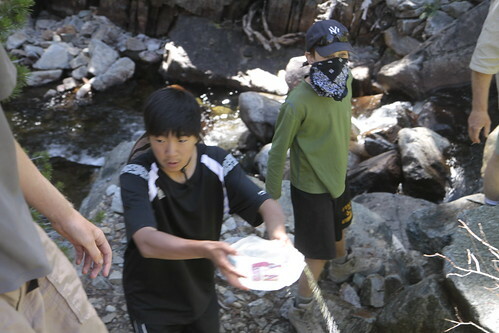 On our Boy Scout trek in the Hoover and Emigrant Wilderness Areas, about half the crew brought basins made from the bottom of a plastic milk jug. Cut it just below the handle, and you have a free, ultralight basin. The original idea was to use it to keep the freezer bag meals from falling over while they were rehydrating, but we kept finding new uses. 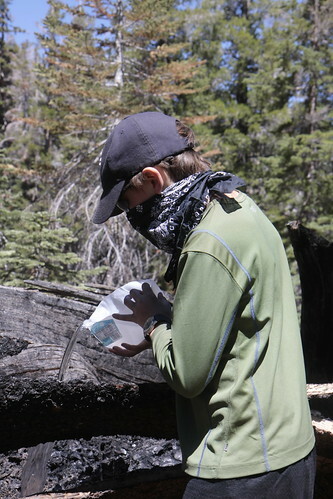 The least-expected use was for a bucket brigade to fight a single-tree wildfire that we found. The initial containment and a satphone report were done by Troop 959 from San Diego, but they needed to move on to evac an ill crewmember. Our crew (Troop 14, Palo Alto) took over and spent most of an hour putting it all the way out. Since we had forgotten to pack a Pulaski or a big crosscut saw or even an Indian pump, we had to improvise. Here is a photo of the fire when we took over. Here is our bucket brigade, getting water from nearby Cascade Creek. The milk jug basin is being passed up. We also used two cooking pots, but an extra five basins made a big difference. Once we knocked down most of the fire, we used the basins to attack the remaining hot spots. Also note: one of the 100 uses for a bandana. As far as we could tell, a campfire had lit a tree root under the fire circle, and that had smoldered through the root system, eventually consuming the major roots on one side of the tree and lighting the core. The tree fell after the roots on one side were destroyed, opening it up for more fire. 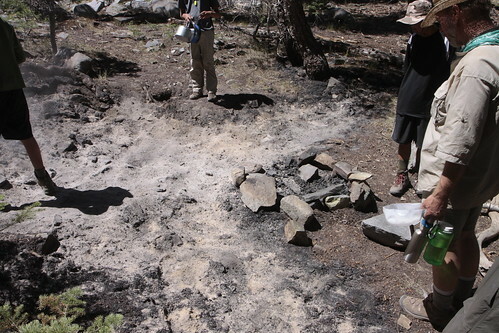 This photo shows the original campfire ring along with the surface area that was burned to ash above the destroyed roots. 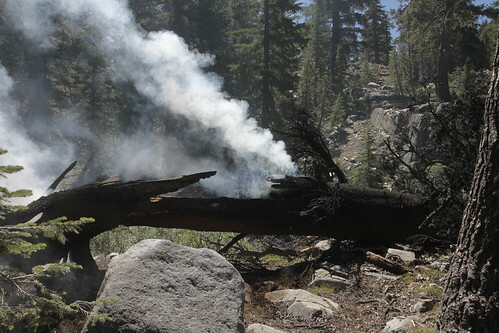 The incident number for this fire is HTF-952 EK1P, according to the Sierra Front Interagency Dispatch and the WildWeb website (check out August 2009 fires and look for the wildfire labeled “Walker Creek”, even though it was Cascade Creek). That list shows it as a false alarm, probably because we had the smoke knocked down by the time that a helicopter and an airplane flew over to check (we saw them). Maybe I’ll call them up and correct the report. The rest of the fire photos are at flickr, tagged with HTF-952. Overall, it was the best innovation of the trip and by far the cheapest. A couple of Scouts said they would take one on every trip from now on. For me, it is right up there with a bandana for a multi-use, lightweight item. This entry was posted in Backpacking & Hiking, Scouts BSA and tagged 50 miler. Bookmark the permalink. ← How do you know that your shoes breathe?